When it comes to Virgin broadband deals, there's a lot to love. 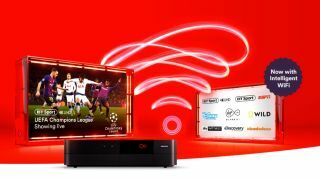 With some of the fastest speeds on the market, tonnes of TV options (BT Sport and Sky Cinema included), one of the things that puts many potential customers off is the price. But with Virgin Media slashing the costs of some of its most popular bundles, now is the time to indulge in Virgin's fast internet and vast TV collections without burning through your hard earned cash. With savings of up to £72 on a range of broadband and TV deals, there's a lot of options with these price cuts. Whether you just want affordable fibre broadband or you want to go all out with the fastest speeds and every channel imaginable, we've listed all of the options below. Or if you want to compare how these new prices match up to the rest of the market, check out our guide to the best broadband deals currently available in the UK. If TV isn't important to you then the VIVID 100 package should be perfect. Offering average speeds of 108Mb at an affordable price tag, this package screams affordable fibre broadband deals. And like Virgin's other broadband offers, its only a 12 month contract so you don't have to feel too tied in with the 18 month contracts other providers tie you in to. For the households that want a good selection of TV and fast fibre speeds without going all out on price. The Mix Bundle offers up over 150 channels and average download speeds of 108Mb, superfast fibre to keep even the more active families going. Hitting the perfect middle ground between costs and content, the Player TV bundle offers fibre speeds and over 70 TV channels for your viewing pleasure. It only gets better with the addition of 4K BT Sport. That's all five BT Sport channels including rugby, football and UFC all in 4K Ultra HD. (To add BT Sport at this reduced price, simply click 'view deal' and then scroll down to the 'take your bundle to the next level' option). Want to go all out on your Broadband and TV deal? Then look no further. Offering up over 240 channels including Sky Cinema HD, Sky Sports and BT Sports in 4K Ultra HD - this is about as good as TV gets. Paired with speeds averaging 213Mb, the only downside of this offer is the price. We are now at the point where around 60% of the UK households are able to receive superfast Virgin broadband. It's easy to find out if you're one of the those lucky people. Head to our dedicated Virgin broadband deals page (or the price comparison chart at the bottom of this page), enter your postcode where indicated at the top of the page and if deals show as available then you're laughing.